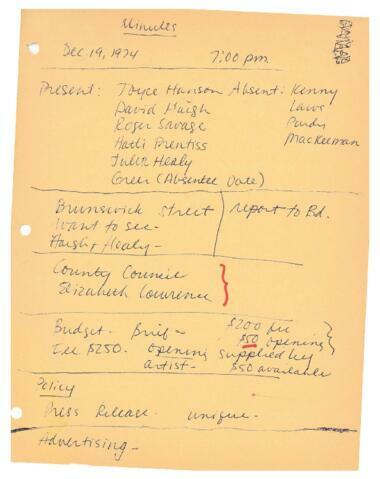 Item is a handwritten set of minutes of a meeting the Board of Directors of Eyelevel Gallery held at an unknown location on December 19, 1974. Members present were Joyce Hanson, David Haish, Roger Savage, Hatti Prentiss, Julia Healy and John Greer with an absentee vote. The meeting discussed a Brunswick Street location, the gallery's budget, press release policies, and exhibitions at the Eyelevel Gallery for artists on the gallery's board.